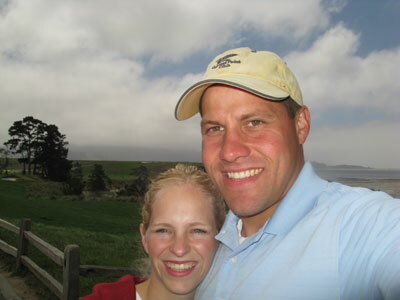 A single entry blog about Bill and Stacy's trip to San Francisco/Monterey, California. Remember what life was like before having kids? I do. We could load up and leave to go somewhere in ten seconds flat. Now days, if we take ten minutes getting loaded we are doing good considering we have to get all the kids shoes on, sent out to the garage, buckled up in the minivan, and on the road. We used to eat warm meals too. But now, by the time we get all the kids� food served, sippy cups filled, spills cleaned up, and everything else squared away the steam is gone from our food and it is another cold meal. When we were first dating we would sit at a restaurant an wonder how the family sitting next to us couldn�t control their kids or clean the snot running down their baby�s face; now we�re that family. Therefore, once a year my wife and I try and take a vacation with no kids and retreat to that non-reality world we used to enjoy. 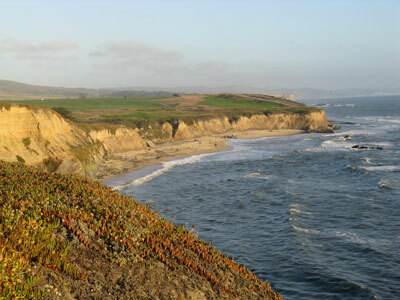 In August 2008, the retreat that my wife and I decided to take was to the California coast. We started in San Francisco and worked our way down to beautiful Monterey. Stacy and I dated in high school before I left to serve a two year LDS mission and then we got married ten weeks after I came home. 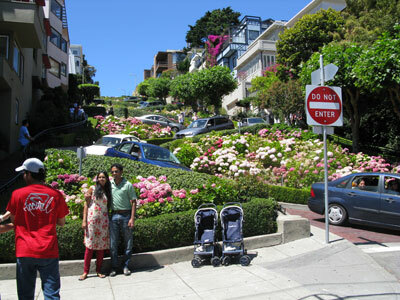 During my time in Houston, Stac moved to San Francisco for four months to be a nanny. We decided it would be a fun vacation to head back there and let her reminisce about her time in the Bay Area and pick up some golf along the way. San Francisco greets us with sunny skies and perfect weather. We spend the day cruising around to sites that Stac remembered while spending her time here ten years earlier. We take photos of the Golden Gate Bridge, drive through her old neighborhood, and of course take our turn winding down Lombard Street. We go check-in to our accommodations at the Marina Motel located in the Marina District not too far from the wharf. This quaint motel is right up my wife�s alley; old, historic, and tons of charm. 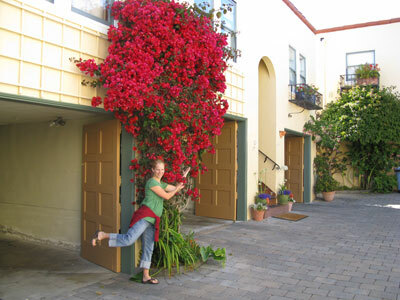 It�s one of the few places that offers free parking and the rates are quite reasonable. We ate at the popular A-16 restaurant which is a nightlife experience you can�t find back in Pocatello. The next morning we took the coupon found in our room and ate at Judy�s Caf�. My wife ordered the cream cheese stuffed French toast with strawberries and bananas while I ordered the crab and spinach omelet with hollandaise sauce. All I can say is . . . Wow! What a fabulous breakfast. My wife still brings it up often as the best breakfast she has ever had. They offer fresh squeezed orange juice and are located in a tiny little 2-story building that often sees a line out on the sidewalk. After breakfast we found our way over to the wax museum and enjoyed snapping plenty of pictures with �celebrities� of all walks of life. We�ve run out of time to see the sights since I�ve scheduled an afternoon round at Harding Park Golf Course. Stac drops me off and goes and enjoys a movie while I visit the famous course named after the former U.S. President. Harding Park borrowed $16 million to revitalize the course which was good enough to attract the American Express Championship that saw Tiger Woods beat John Daly in a playoff. In preparation of the 2009 President�s Cup, there were several more bunkers being added and work being completed when I arrived on site. Overall, the course was in really nice shape for a heavily played municipal course. There is a special feeling about playing a storied course like Harding Park that is cut through huge Monterey Cypress trees. Like a fine wine, a course should get better with age and the towering trees at Harding Park epitomize that. The course routing for day to day play is different than the routing that was used for the President�s Cup, but the overall layout is a classic and gives the general public an affordable opportunity to play where the pros play. My favorite hole of the day was the finisher (15th hole for the President�s Cup) that plays over the lake and then doglegs uphill to the green. Stac picks me up after the round and we embark on the stunning coastal drive down to Monterey as the sun begins to set. There are several locations across the globe that could contend for having the best golf location and courses on earth. Of that list, the Monterey Coast would find itself in the #1 spot on several people�s list that are in �the know.� With stunning Pacific Ocean coastline, massive sand dunes, majestic Monterey Cypress trees, and courses like Cypress Point, Pebble Beach, and Spyglass Hill; the Monterey Coast is tough to beat for an avid golfer. On our way down to Monterey we stopped at Half Moon Bay to take a peek at the golf course. I've played the Ocean course before, but have never teed it up at the Old course. Stac instantly thought we needed to schedule another trip and come back! After 15 minutes or so, we take off and roll into Monterey to check into our hotel room and get rested up for the activities that await us the following day. I have the Pete Dye designed Carmel Valley Ranch course scheduled for early in the morning while Stacy enjoys one of the few times she can sleep in. The inland course is relatively short (par 70) but is attractive and recently underwent some renovations. The back nine is quite dramatic with massive elevation changes and is rather fun to play. Being the first player out and no one else in my group, I�m able to blaze through the course and get back to my wife in time to enjoy breakfast together. We spend the middle of the day together driving along 17-mile drive and stopping into the Cypress Point clubhouse to pick up some apparel. Afterwards, we head over to historic Pebble Beach where people are allowed to roam the course along the cart paths. We start at the 18th green, take some photos, and start walking the course in reverse. We walk along the 17th hole and then cut over to the 4th hole are work our way past holes 5, 6, and 7. Snapping several photos along the way, we camp out at the base of the cypress tree left of the 7th hole and watch a couple of groups take on one of golf�s most celebrated par threes. We then walk along the 8th hole, my favorite hole in all of golf. I could sit and watch golf there for hours but Stac is ready to move on and I�m getting itchy to want to tee it up. Late that afternoon we have a tee time setup for Pacific Grove which is a short little muni course that has one of the best parcels of land a golf course could hope for. Known as the poor man's Pebble Beach, Pacific Grove is drowned out of attention due to the amazing courses it shares the Monterey coastline with but is the perfect place to play golf with your wife or kids for an affordable price. A group of deer await us on our first couple of holes and we are paired with a Father-Son duo from England. The front nine is rather pedestrian before embarking on the back nine sand dune holes that run near the coast. We have a blast golfing together as Stac relishes the opportunity to golf without having to worry about kids asking for a snack or wondering when it�s time to go home. One of the things we love to do on vacation is to go eat at places we don�t have back home and try foods we have never tried. Pocatello�s only seafood exposure is found at Red Lobster so we thought it would be a great idea to visit a local restaurant that offers freshly caught seafood. We found a building that looked slightly rundown on the exterior with tons of cars parked outside; perfect! We ordered some crab cakes, fresh fish, and a pasta dish that hit the spot perfectly. Afterwards we found our way to a movie theatre where we digested more buttery popcorn than the human artery system should enjoy in a day. The next day we again sleep in before going to play on the beach. It really doesn�t matter how cold it is at the beach when you are from Idaho. Idaho is so far removed from the ocean that once you have a chance to play it in, you do it at all costs. Fortunately it wasn�t too cold. It wasn�t super warm either, just cloudy. 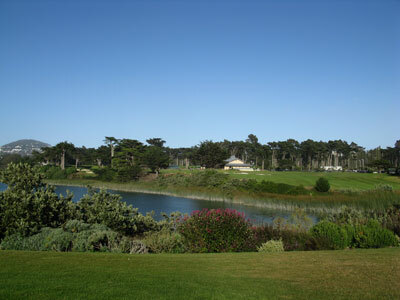 Afterwards we went over to play a course I�ve been dying to see for a long time; Monterey Peninsula Country Club. The Shore course, which is what I had scheduled that afternoon, we completely reworked by Mike Strantz. Strantz began his work in January 2002 and reversed the routing of the majority of the golf course. Now, several of the holes look at and play towards Cypress Point rather than away from it. Mike Strantz is an artist first, and a golf architect second � and he�s brilliant at both. The entire time I�m playing the course (Stac rode in the cart with me) I kept telling my wife, �This feels like we are playing through a series of paintings. This is stunning!� Each tree, bunker, fairway, and green seemed to be placed perfectly to frame different aspects of the course and the surroundings. 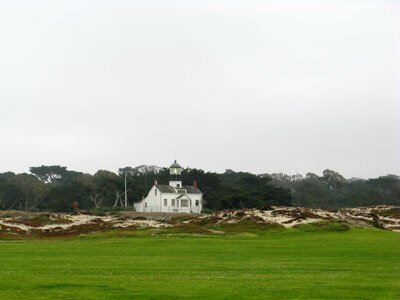 Playing MPCC Shore was the kind of surreal experience that I hadn�t had since playing Cypress Point and the courses at Bandon Dunes; it�s simply that special. Beating my playing partner, a golfer for Monterey Peninsula Community College, with a 75 from the tips didn�t hurt the experience either. 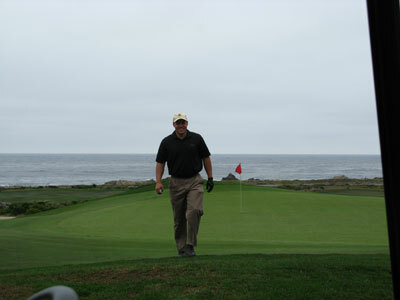 The Shore course at Monterey Peninsula Country Club was Mike Strantz�s final and most impressive piece of work. He gave all the passion he had to the course as he knew his battle with cancer would soon be over. The result is one of the finest courses I�ve ever had the pleasure of setting foot on and a course that will surely gain greater and greater recognition as the years go by. Following our experience at MPCC it was time to hit the road and work our way back up to San Francisco. We arranged to stay at a hotel in Hayward which was just a few miles from the new Stonebrae Golf and Country Club. Stonebrae was designed by David McLay Kidd, famous for his work at Bandon Dunes where he was employed to design the first course to be placed on that precious piece of property. Stac was excited because she would be teeing it up with me today and I told her we would likely have plenty of time to enjoy the experience since it was a private course and a weekday. My assumption was right, but it was even better than I had thought. When we checked into the course we would slated as one of two groups on the course for the entire day. Wow, what a treat. We found our way over to the driving range where there were piles of Pro-V1 practice balls awaiting us. Some early morning fog was on the course and I wanted to get some good pictures so we spent an hour on the driving range together. That hour was more time spent practicing than Stac had spent her whole life. Naturally athletic, Stac has a solid swing but her scores suffer from a lack of practice; I know that is a real shocker given the fact that we had four kids under age 7 at the time. During that precious 60 minutes, something clicked and my wife really started to swing the club well. We ventured out on the course and I enjoyed watching my wife play the finest golf I�d ever witnessed her play (granted, she still shot around 100 for the round). I played a great round myself as I managed a 75 from the tips at a course I obviously had never played before. Coming in on the final hole we ran into the course superintendent and he told us about Stonebrae�s recent contract with the PGA as the course would become the TPC at San Francisco Bay and would host a Nationwide Tour event in place of the event Wente Vineyards had previously hosted. He also mentioned that the nines would be reversed for the tournament which was better for viewing, but worse from a drama perspective. With our final round of golf in the books it was time to load up and head back to reality. As much fun as it is to retreat from the kids, Mom and Dad are anxious to get back and see their four little girls. It�s time to get back to responsibility and reality, but at least we developed memories that will endure a whole lot longer than the few days our San Francisco retreat lasted.